Kind on time, Tough on fat. Choose HIIT for a greater fat burn! - burn more calories in less time. - each workout is so short, ranging from 7-30mins. - it's interval based and uses a large variety of different lifts/exercise, keeping the workout fun and interesting. - it enhances mental toughness and pushes your physical boundaries. With all this said, it's important to understand that HIIT is very demanding on the Central Nervous System and sufficient rest is required to get the full benefits, otherwise you'll be left over trained and struggling to break through plateaus. 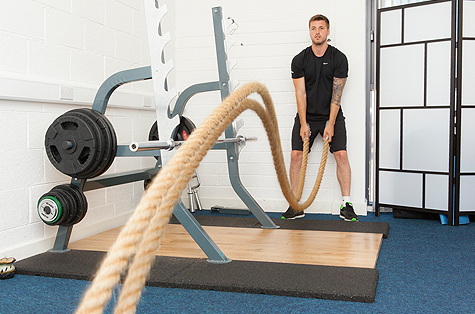 Because of it's intensity, HIIT needs to be adapted for differing levels of fitness. This is a total body weights routine that aims to create a big build up of lactic acid. The more lactic acid produced, the more growth hormone secreted, the more fat is burned. Aptly named the “Death Circuit” this is one of the toughest workouts you can perform. It's short, extremely challenging and will leave you breathless. This style of workout will help increase lean muscle mass and burn through excess fat stores. This is my favourite cardio workout to do in the gym and gets you out of the weights room once or twice a week. Its important that you are familiar with the treadmill before trying a workout like this. Here's how I like to do it: 1 minute working – 4 minute recovery jog. 4 minute warm up at a slow jog, 8km per hour. Recovery: Jog @ 8km per hour for 4 minutes. * It is important to note that if you have not trained for a while then you will need to build up some fitness and strength before enduring a HIIT training phase. For a programme suited to you, contact ciaran@ciaranfoy.com.